Hello! 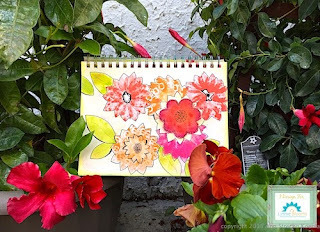 Ann from the LB Design Team and the blog AnnMakes with a blooming show n' tell! I just can't get enough flowers in my life. I grow them, I plant them and I even craft them. No wonder I love using Linnie Bloom products so much! I love being outside in the summer time and using our pool. Right now it is still a bit too cool for a swim but it is still nice place to sit and do some drawing. Here is a shot of my latest art journal page that was inspired by some of the flowers we set out by our pool. I am working in a Canson Mix Media 7 x 10, 9olb journal. I used The Flowers and Blooms Stencil and masks set from Linnie Blooms and the Petal Flower in canvas, also from Linnie Blooms (both available here). The background is painted with Colourarte Watercolour paint in Vanilla. 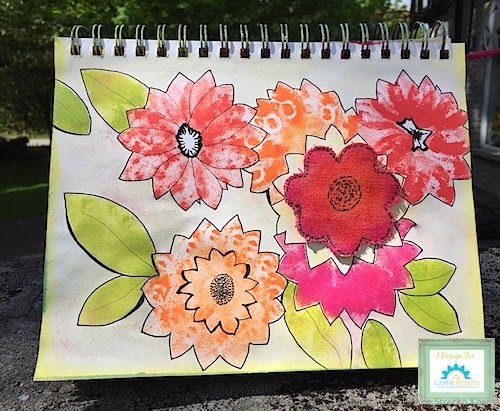 The inks used in the flowers are old ink pads I had. (Color Box). I made the black outlines with Micron Pigma pens from Sakura. This is a picture of just the journal page. I really enjoy using these stencils and masks in my art journals as they are the perfect size, they are durable, easy to clean, and come packaged in a ziplock bag. Making these the perfect travelling artist supply! For more ideas, please visit my blog. Thank you for stopping by.